Are you looking for a book to share with children on Halloween? Aliens Are Coming! may be just what you need. 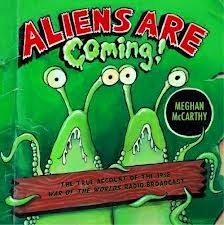 This informational picture book recounts how Orson Welles scared the pants off the entire country with the War of the Worlds radio broadcast on Oct. 30, 1938. At the beginning of the book, readers get a glimpse of life in the 1930s as McCarthy uses black and white paint to illustrate a family sitting around the radio listening to Ramon Raquello play the tango. When the announcer interrupts the broadcast with news of explosions on Mars, things get serious in a hurry. Colorful illustrations of aliens landing in Grovers Mills, New Jersey accompany excerpts from the actual radio transcript. As citizens follow the news of a possible alien invasion, panic ensues until it's revealed to be a hoax. McCarthy is a pro at relating history to children in an accessible and exciting manner. The cartoon-style illustrations and characters with google eyes will make this a popular read with kids. A detailed author's note provides readers with more background information about Welles' radio prank and its effects on the nation. If you're planning to share the book with a group in a classroom or library, be sure to play parts of the War of the Worlds radio broadcast. Visit Meghan McCarthy's web site to view pages from the book.